With March Madness in full swing, we can’t get enough of basketball. Team sports are so captivating. Although we may have hung up our basketball shoes some time ago, there’s so many team sports we can get involved in as adults. 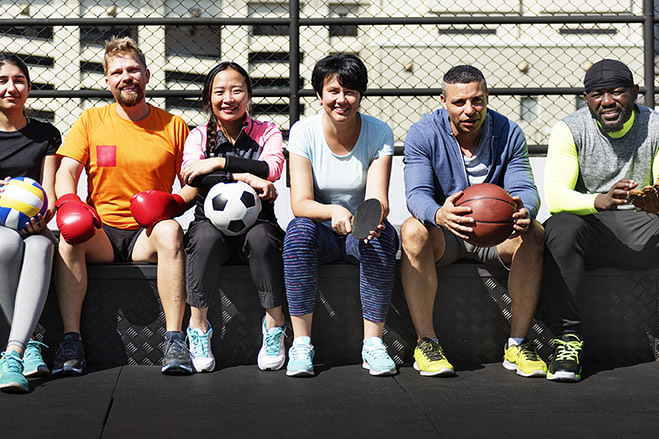 From pick up games at the local gym to walking clubs, there are enormous health benefits to be had from participating. If it has been a while since you’ve participated in a sport or exercise, you may experience some sore muscles. Turn to Superberries Aronia Berry Products to help with your exercise recovery. Superberries supports joint health and can help alleviate aches and pains. Research has shown that taking Aroniaberries can also help with the oxidative stress that occurs during exercise. Participating in a sport is great exercise. It’s essential to get at least 75 to 150 minutes of exercise a week. Being part of a volleyball league or any exercise club or class is an easy way to get those minutes. Learning how to play well with others is an important skill to learn at any age. Team sports later in life help reinforce team building skills. Playing in team sports requires us to express ourselves to our team. Good communication skills are important for self-esteem and success in life. Because of the time spent together practicing and playing games, members of your team become important relationships in your life. If you are participating in a sport or exercise class, you become better at time management. You have practice and games you need allow for in your schedule so you become more efficient with the time you have. People who participate in sports are healthier and happier. A study found that physical activity and playing sports have a significant influence on the life satisfaction of the participants. Being part of a team or club gives you a sense of belonging which makes you happier.